This research project aims to deepen understanding of the issues involved in level crossing removals so that when proposals for specific locations are considered, professional, government and industry stakeholders, as well as the community can participate in a more informed way. The project is part of on-going investigations of better integration of land use and active transport futures for Melbourne. It is the design research component of the research project The Benefits of Level Crossing Removals: Learning from Melbourne’s Historical Experience. Since 2005, this work has been supported by Australian Research Council grants and by industry partners in state and local government, as well as in the private sector. During the last decade, working with our industry collaborators and also with students in architecture, urban planning and design, we have tested a range of scenarios that explore possibilities for enhanced public transport and urban intensification. In 2012, we commenced the Transit for All project, funded by the Carlton Connect Initiative of the University of Melbourne. 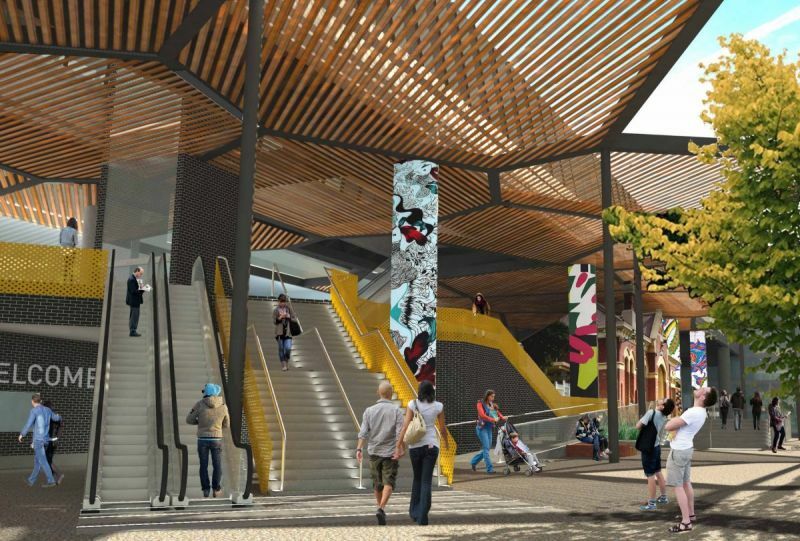 Graduate student designs for new stations for Melbourne’s suburban rail system were used to stimulate debate among the public and private sector networks of professionals responsible for much of Melbourne’s recent work on new stations and level crossing removals. We began that project with an agnostic view on the relative merits of rail-under or rail-over options for level crossing removals. However, after reviewing the work produced over three iterations of our design research process, it became clear that elevated rail had some distinct advantages over the typical ‘trenched rail’ designs being constructed around Melbourne. Our two new reports summarise the findings from two case studies exploring the potential of extended elevated rail for two very different rail corridors in Melbourne: The Upfield Line (through the inner and middle northern suburbs, a former industrial corridor now in transition) and the Frankston Line (in the southern bayside suburbs). Urban renewal: greater potential for multi-scale economic and social development related to increased activity around stations. Realising these benefits depends on the design quality of elevated rail. These design explorations for the Upfield Line and the Frankston Line utilise and exemplify a set of criteria by which planners, politicians and members of the community can assess any proposal for level crossing removals using elevated rail, or for that matter, any new rail line or extension.